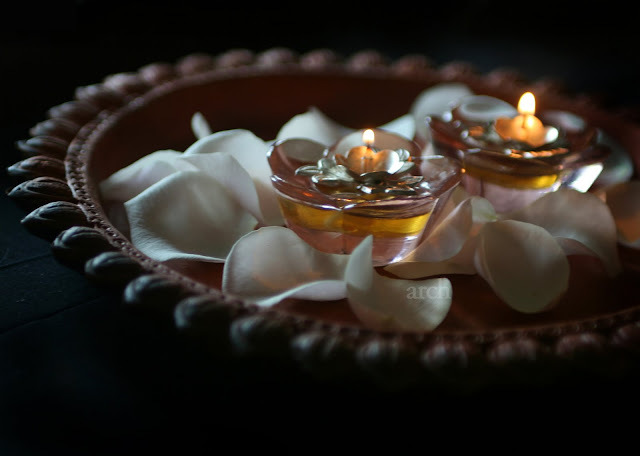 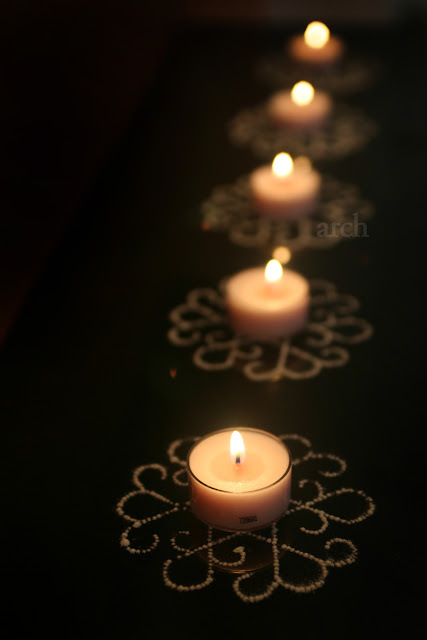 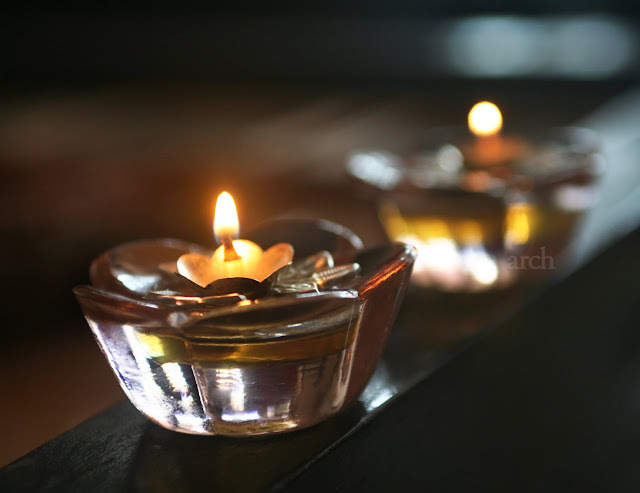 Tealight candles have become a big part of the Diwali illuminations in many Indian homes. 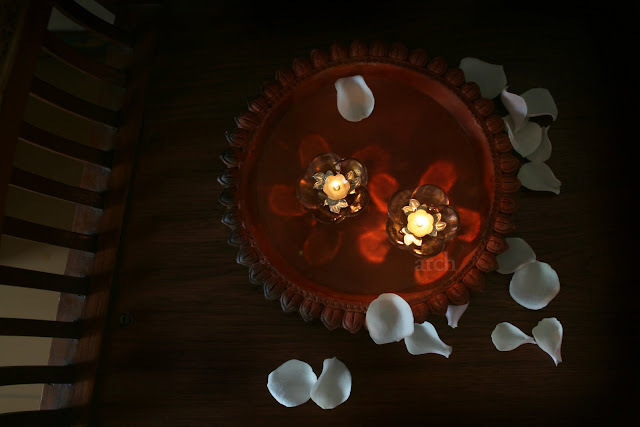 I love using these along with the traditional oil diyas. 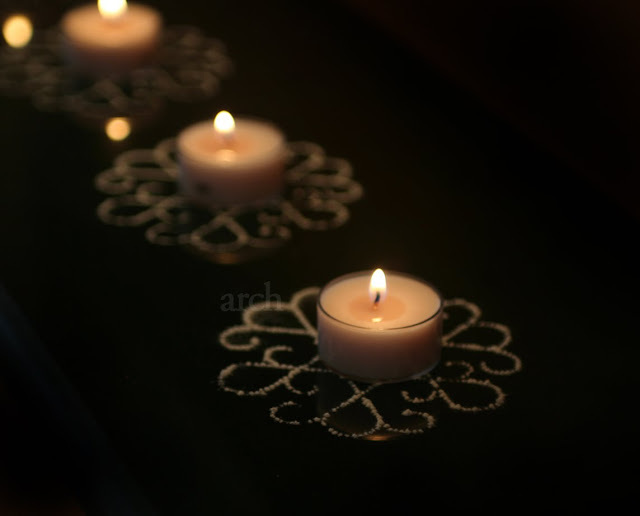 I wanted an interesting background to form a base for these candles. 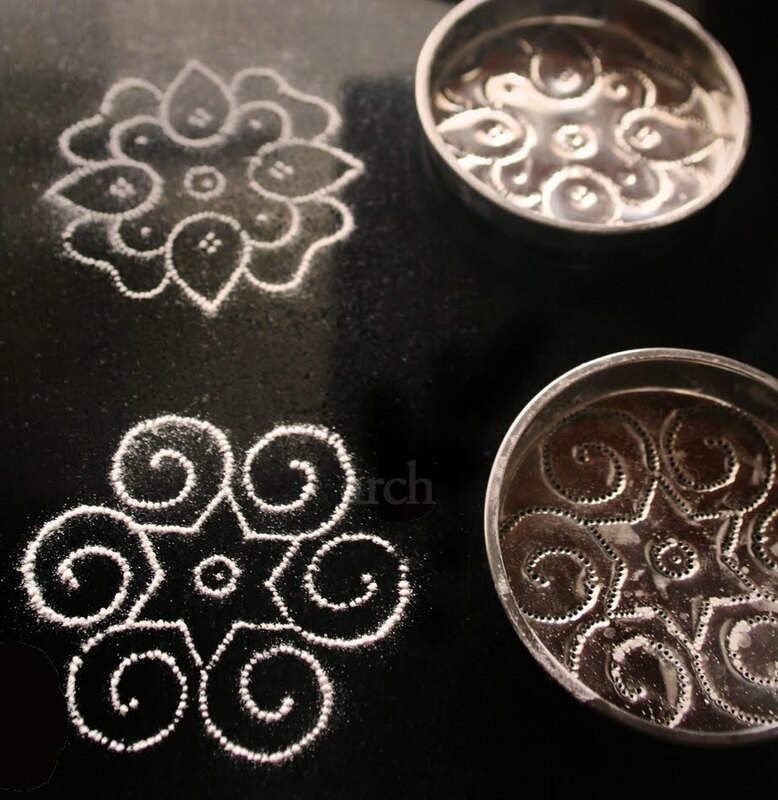 Coasters were one option but I zeroed in on traditional 'Kolam' stencils available widely in stores that sell 'pooja articles' or stalls near temples. 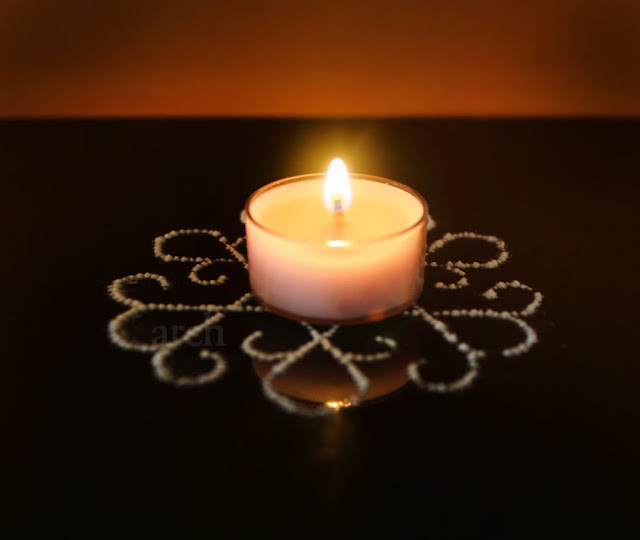 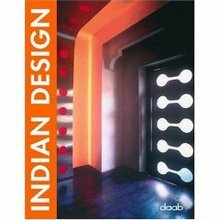 As the festival of lights approaches, my head is bursting with various ideas to try out at home. 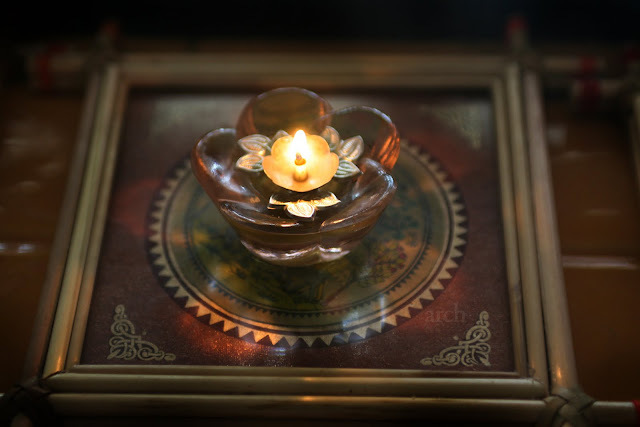 Recently I picked up these small glass oil lamps. 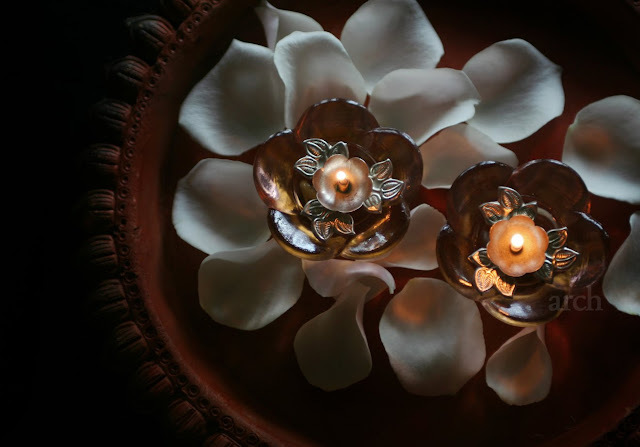 It's a small flower shaped glass container with enough space for two tablespoons of oil. 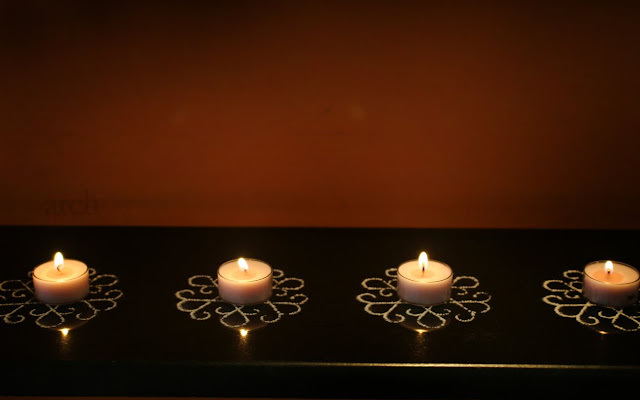 On top of it goes a detachable metal flower-shaped wick holder! 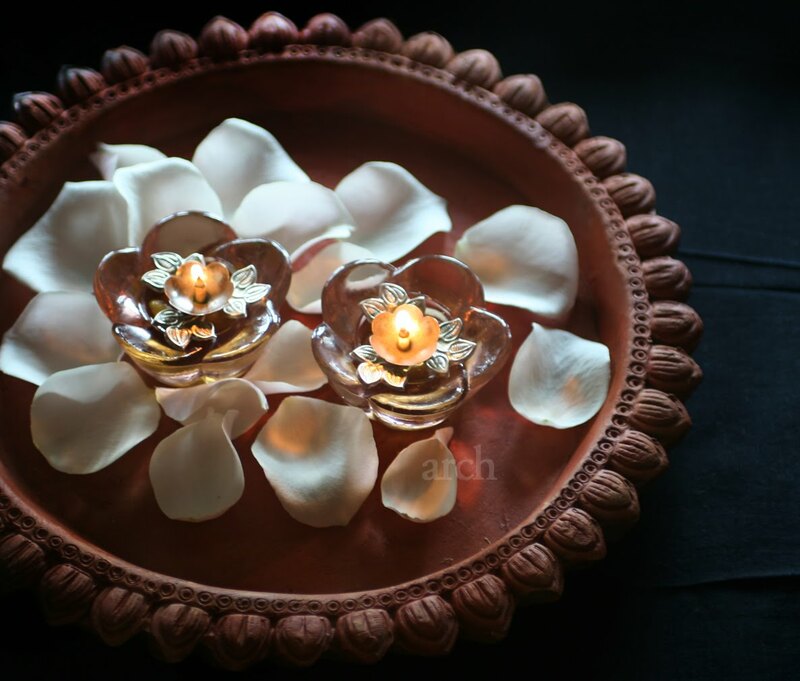 Placing them on a terracotta plate and scattering white rose petals makes it a lovely center of interest. 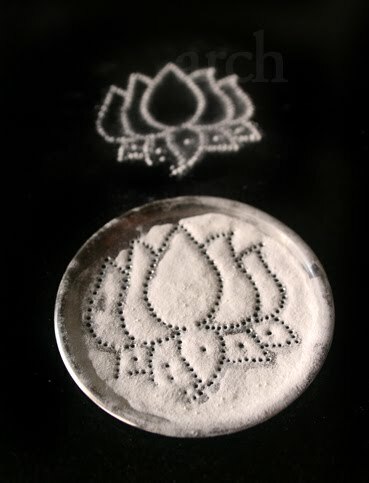 Here I have placed it on small framed 'Patachitra' painting. 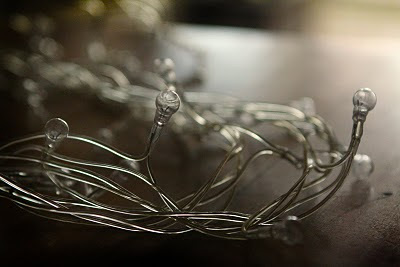 Yesterday while cleaning the drawers I found a string of fairy lights. 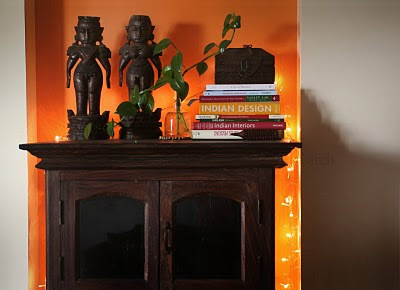 I draped it on our antique medicine chest and saw stars descend into our living room.A simple idea that can transform your space. 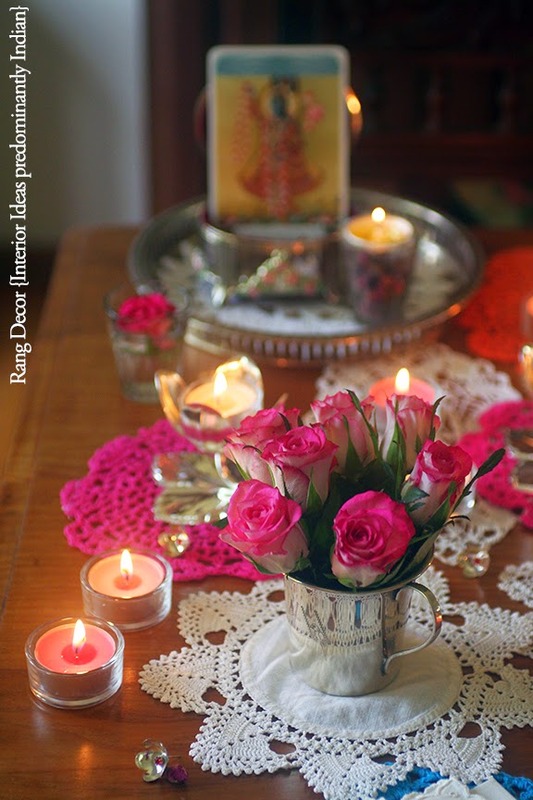 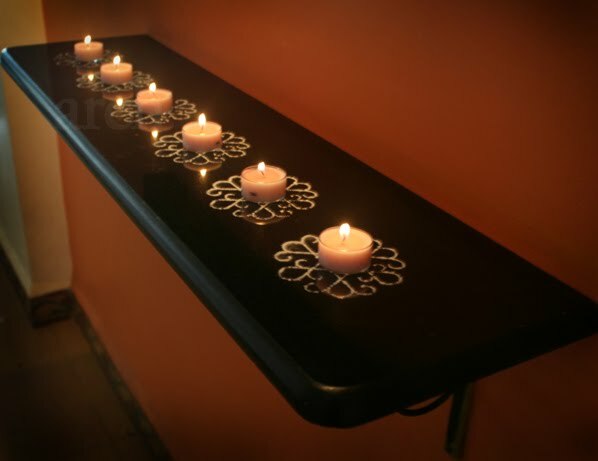 Hope to share more simple decorating ideas for diwali from my home. 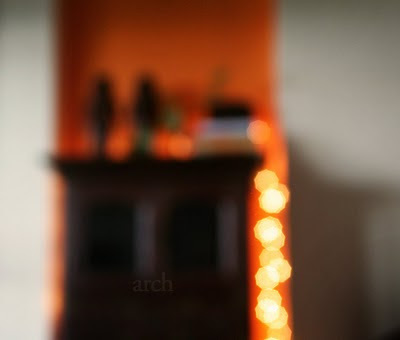 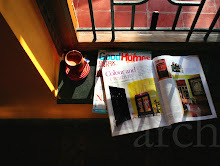 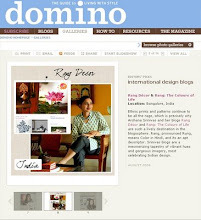 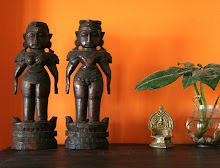 Remember the lovely Creative Corners's of Karthik Vaidhyanathan's home in Bangalore? 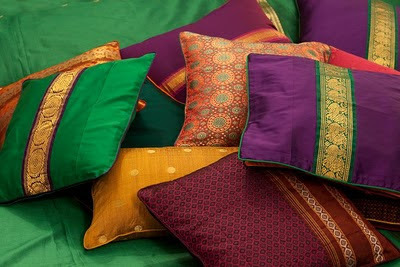 He's back this time with Varnam~ A colourful line of home furnishings. 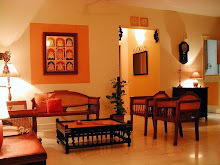 A full-time media professional with a passion for interior design, Karthik's Varnam showcases the amazing beauty of traditional Indian handmade textiles. 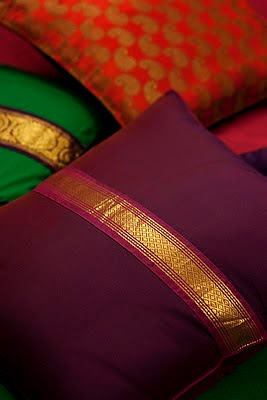 Karthik explains, "Varnam is a sincere attempt to highlight some of the inherent beautiful qualities that traditional Indian fabrics possess. 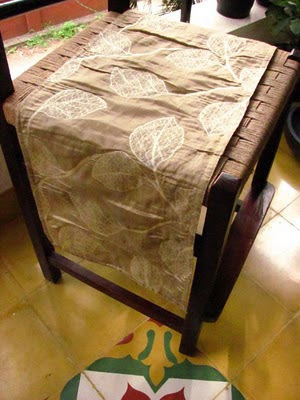 The product line consists of table runners, curtains, cushions, etc. 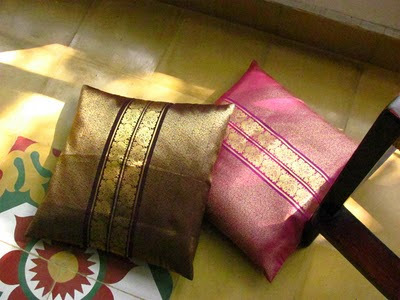 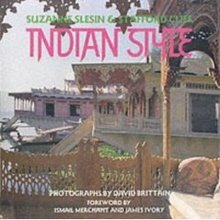 all handmade from Indian sarees and blouse materials. 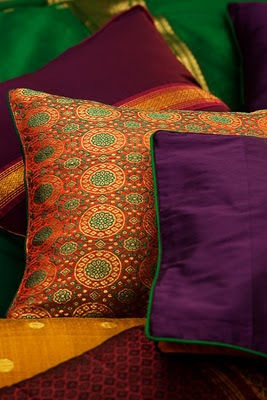 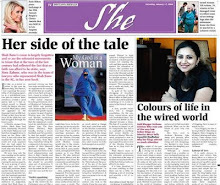 I felt these were apt since Indian stories incorporate some of the most beautiful patterns, colours and motifs. 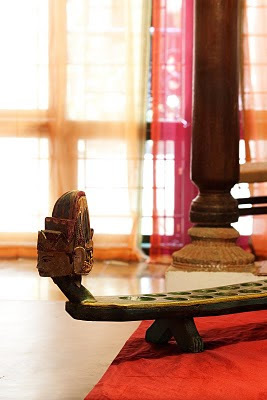 The sarees include traditional nine yard Maharashtrian sarees or ‘Navvaris’, cotton sarees from Tamil nadu , Andhra Pradesh and Karnataka. 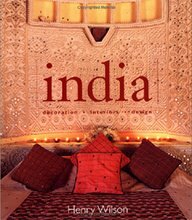 I have also made use of the very popular and blouse material traditionally used by women along the Maharashtra-Karnataka border, ‘Khan’." 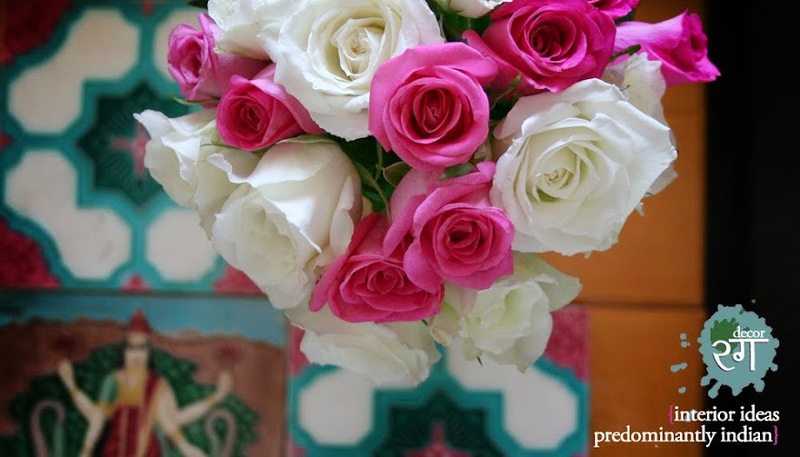 The products are simple with no added embellishments. 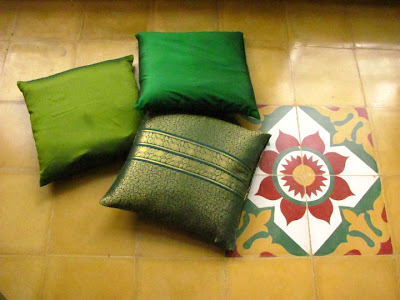 Varnam is being showcase at The Ants Store in Indiranagar from October 22nd to 24th, 2010. 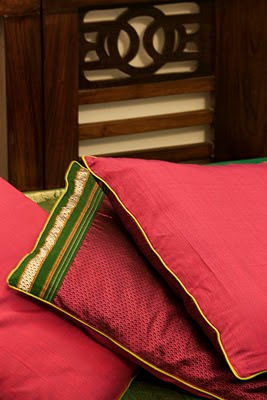 If you are in Bangalore do drop by and check out the stunning range of home furnishings from Varnam.